Control zones based on the Oslo Accords. 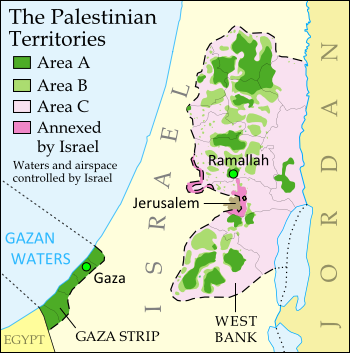 Area A: Palestinian control; Area B: mixed Israeli-Palestinian control; Area C: full Israeli control. Map by Evan Centanni (sources: Natural Earth, B'Tselem, U.N. OCHA oPt). The partially-unrecognized State of Palestine is not only divided between Palestinian and Israel control - even the Palestinian-administered areas have been governed separately for several years now. However, this month rival parties Hamas and Fatah have finally come together to reunite the West Bank and Gaza Strip under a single Palestinian government. The rift in control opened up in 2007, after religious militant group Hamas won a majority of seats in the 2006 Palestinian legislative elections. Hamas and Fatah, the current ruling party at the time, failed to form a stable unity government then, and the conflict between them escalated into a short civil war in the Gaza Strip. See Also: Is Palestine Really a Country? The fighting ended with Hamas expelling Fatah's administration from Gaza, while Fatah in turn refused to seat Hamas members to the government in Ramallah. This standoff has persisted for nearly seven years, with the West Bank and Gaza controlled separately by the two rival parties. Though both parties supported Palestine's successful bid for recognition in the UN, the two regions have been administered completely separately since 2007. One week ago, Hamas and Fatah finally came together to form a Palestinian Authority (PA) government that includes both parties. This new administration will have jurisdiction over both the Gaza Strip and Palestinian-controlled areas of the West Bank, making it responsible for domestic affairs all across the claimed State of Palestine. Foreign relations (and relations with Israel) are handled instead by the Palestinian Liberation Organization (PLO), which has been around since before the PA was created in the 1990s by the Oslo Accords. The current agreement also does not cover whether PA security forces will be allowed into Gaza, whose security has been handled directly by Hamas since 2007. So for the time being, the two areas may remain separate in at least that regard. Palestine's new unity administration is facing strong opposition from the Israeli government (which refuses to negotiate with Hamas), but has gained acceptance by much of the world. The UN, the European Union (EU), and China have all signaled their willingness to work with the new PA administration. Even the US has come on board, despite having rejected Hamas's 2006 election victory. Because of its hardline ideology and ongoing violence against Israel, Hamas is classified as a terrorist organization by the US government, as well as by the EU. These events come on the tail of another development in Palestine's political status: its entry into 15 international treaties this April. The action was taken by Mahmoud Abbas, who serves as both the President of Palestine and chairman of the PLO. Palestine's applications to these treaties have already been accepted by the UN (which considers Palestine to be a non-member "Observer State" like Vatican City), and most of them were set to go into effect in May. Is Palestine Really a Country? Which Countries Recognize Palestine as Independent? Flag of the State of Palestine is in the public domain (source).